Welsh cyclist Elinor Barker is preparing to "gamble" by riding in two events at the Road World Championships in Norway this month. The 23-year-old won gold and two silvers at the World Track Championships in April. Now the Olympic champion will compete in two events in Bergen from 17-24 September after being selected in the GB road race and time trial squads. "It has been quite difficult to do," said Barker. "I haven't done a huge amount of road racing. I have sort of gambled a little bit and hoped the small amounts I have done will pay off. "I have still been in the gym and training for the track in between road races. "I am in a better place than I was expecting a year ago." Barker finished fifth in the National Road Race Championships time trial in June on the Isle of Man after suffering a puncture. 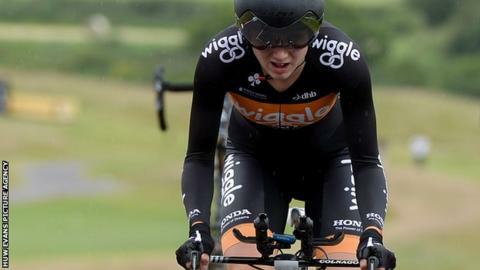 The Cardiff rider has been named in the GB individual time trial squad alongside Hannah Barnes in Norway. "It's hard to say how I will go," said Barker. "The only shots I have had at a time trial have not gone my way for various reasons. "I would be happy with top 20. The course is fairly short about 12 miles, which suits me well and has a bit of a hill. "Hannah has been pushing around the top five so it would be nice to see her break through and make a podium." Barker is also one of six riders who are set to act as road race support for 2015 world champion Lizzie Deignan, who is recovering after having her appendix removed in August 2017. "It will be interesting know to see how Lizzie is," said Barker. "She had her appendix out a couple of weeks ago and is due to get back on the bike in the next couple of days. "It will be interesting to see how she is feeling and that will dictate how we ride the road race." Fellow Welsh riders Owain Doull, Scott Davies and Jessica Roberts have also been named in the GB squad. Geraint Thomas withdrew from selection as he returns to form and fitness, although he will compete in the team time trial with Doull for Team Sky. Barker was part of the team pursuit quartet in Rio 2016 alongside Laura Kenny, Joanna Rowsell Shand and Katie Archibald that took gold. The Cardiff rider also won World Championships points race gold in Hong Kong in April 2017, plus two silvers. Barker plans to double up on road and track for Wales at the Commonwealth Games on the Gold Coast in April 2018, which takes place a month after the Track World Championships.